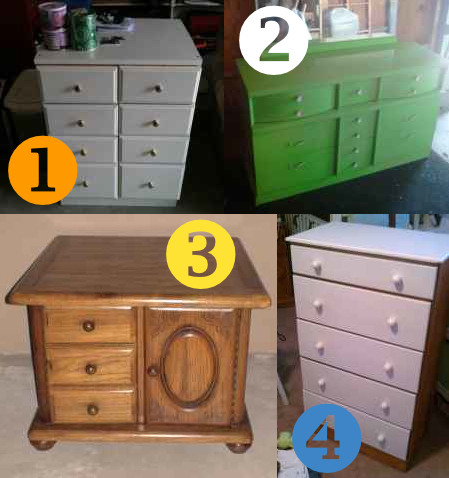 insideways: Homeless Housewares: adopt a dresser! Oh yeah, we have a theme going today. I've been super inspired by several dresser makeovers I've seen lately, so I'm jumping in on the fun. I think I've mentioned the card catalogue look before, but no dresser themed Homeless Housewares would be complete without it. Also, I recently ran across an amazing resource for card catalogue hardware: Schoolhouse Eclectic. $20 for the dresser and $32+ for the hardware, add a little paint? You've got a fabulous card catalogue inspired dresser for about $80! This is a good example of a craigslist find you should go for if you're in love with it or already have the supplies to DIY it up on hand. $180 is a totally totally fair price for this piece, but if you start adding the cost of new hardware or paint you'll be looking at a much steeper final price tag. Always remember to estimate the final cost of a c-list DIY before you drive out to make the purchase. And finally, a totally blank slate. Bam $15. It's saying "do whatever you want, I'm game for an adventure." If you're looking for a project this is the price you're looking for. Just make sure the piece you grab is a) the right dimensions for your room and b) made of solid wood. You are too young to know what a card catalogue is! You must have seen it in a movie ;).